A. H. GREBE & COMPANY, INC.
1924 - The Synchrophase was introduced in August 1924. Here is what you will find on the earliest receivers. 1. Individually operated Tuning Dials with highest frequency tuned being just over 1300kc. 2. VOLUME control is a resistive shunt across 2nd AF transformer primary. Shown as continuously variable resistor on schematic dated August 16, 1924 but this is unlikely (as drawn) since it would be possible to adjust the variable resistor to effectively be a "short circuit" across the primary and connect the 1AF plate to the +90vdc battery without a load. All VOLUME controls encountered are a six position switch with a series tapped wire wound resistor to allow progressive change in steps. Highest setting of VOLUME disconnects shunt and the lowest setting still has a 300 ohm series resistance. See the section below "Radio Circuit Repairs" for more details on this particular component. 6. Audio interstage coupling transformers are identical. DCR of 330 ohms on the primary and 6600 ohms on the secondary. 7. VOLUME and FILAMENT escutcheons changed to have "VOLUME" with -INCREASE- with arrow and numbers 1 to 6 and "FILAMENT" with -INCREASE- with arrow and numbers 0 to 5. This change probably happened towards the end of 1924. Change in "VOLUME" control to reflect the "feel" of the actual stepped-switch control. Errors could happen, JRPI left the factory with two FILAMENT escutcheons installed. 8. The MU-2 version probably changed along with the MU-1 during this period. The MU-2 used a six-tube circuit, all UV-199 tubes. The audio output consisted of a parallel pair of UV-199 tubes. 1925 - The upgrades listed below probably were designed during the Summer of 1925 and incorporated into production by August, 1925. April 1925 QST article does not mention any planned improvements which would seem to indicate they date from at least after the article but before the schematic date of August 29, 1925. 3. TONE COLOR Control added. It uses the old Volume Control tapped series wire wound resistance with a series capacitor added to create an RC tone control - it's still a shunt across the 2nd AF Transformer Primary (schematic 8-29-25.) Position 6 disconnects shunt. TONE COLOR Series capacitor has a measured value of 0.5uf - See section below "Radio Circuit Repairs" for more details. 5. Escutcheons changed to have VOLUME - OFF - numbers 1 to 5 and TONE COLOR - numbers 1 to 6 - NOTE: "OFF" was always a function provided on FILAMENT control, just not marked. 9. Hook-up Card that is underneath the cabinet was changed to show two +45vdc B batteries - earlier cards show four +22.5vdc B batteries - may not be directly part of mid-1925 upgrade. 12. It appears that the MU-2 followed the MU-1 evolution and incorporated all of the above changes. The MU-2 circuit was also changed in 1925 to use four UV-199 tubes and one UX-120 tube. 6. S-L-F metal labels installed on top of standard chain drive sprocket caps. The metal tags are replaced by having "S-L-F" embossed into the sprocket caps. Not related to 1926 upgrade. 7. Some MU-1s appear with only the Detector tube socket using the new "Cushioned Tube Socket." Reduction of "microphonics." This change appears somewhat later than changes 1 to 5. 8. All sockets in the receiver are changed to the "Cushioned Tube Socket" style to reduce "microphonics" - This change seems to be somewhat later than change 7. 9. Some later cabinets have two right-angle brass braces to help support the back of the cabinet from coming loose or breaking the glue joints. Not related to the 1926 upgrade. 10. 1926 MU-1 manual states that escutcheons are "gold lacquer"
11. It's likely that the MU-2 was not produced after mid-1926 since it isn't mentioned in the Grebe Synchrophase Manual copyrighted 1926. Lid Props - Usually the earlier MU-1 is found with two lid props but there are some exceptions. Probably stock on hand might have affected when only one lid prop was installed. Generally, it can be said that nearly all early receivers have two lid props and all later receivers have just one lid prop. Insulated Sleeving Color - Hard to believe that this varies as much as it does. Early receivers seem to use mostly medium brown sleeving while mid-production receivers might be found with dark greenish-gray colored sleeving. Some receivers seem to have very dark brown or black sleeving. It's likely that whatever was on hand was what was used, thus the variability. Instruction and Hook-up Cards - Naturally, the data changed on these cards depending on model type (MU-1 or MU-2) and on when the radio was built. The variations we are referring to is the color of the cards and the color of the writing. The earliest cards are beige with black letters. Later cards change to yellow card stock with black letters. Sometimes the Instruction card will be yellow and the Hook-up card beige (although in some cases this is due to a dealer upgrade.) Sometime in 1926 the card stock went to yellowish-beige but with red lettering for a short time. Most later receivers have the light yellowish-beige card stock with black lettering. Mottled Finish on Late- Production Tuning Dials - Some late production MU-1 receivers will be found with tuning dials that are "mottled finish" in black and dark red. This finish was sometimes found on some larger dials manufactured for the homebuilt radio market. Nearly all MU-1 receivers have black dials with gold filled numbers and graduations and so far only one example has been found with the dark red-black mottled dials. This MU-1 is letter coded XBLW and has all cushion sockets and embossed S-L-F sprocket caps which dates the receiver to late 1926 up to early 1927. Additionally, XBLW has a red lettered hook-up card but the instruction card is yellow with black letters. It appears that earlier Grebe receivers, the CR series, were serialized using numbers - apparently sequenced chronologically - typical of most production from various radio manufacturers. Things change with the introduction of the Grebe Synchrophase receivers, which are serialized using a four letter designation. This letter combination always consists of four letters regardless of when the receiver was built. The letters are found written in ink on the upper right corner of the Instruction Card and the letters are also engraved and white filled on the back of the front panel on the left side. The four letter combination seems impossible to decode. No chronology or sequence can be easily found in the combinations. The belief among collectors has for years been that nothing can be determined from the serial letter combination. BUT, maybe that's what Grebe wanted. Remember, the Synchrophase was produced knowing full well that it violated the Neutrodyne patent and that a law suit was going to be inevitable. Perhaps the serial letter combination was to obfuscate the true number of Synchrophase receivers being produced. After all, a settlement might have required some sort of compensation to Hazeltine (and the IRM) based on the number of receivers sold. So why make it easy to see just how many Synchrophase receivers were being produced? It seems likely that the factory must have had some kind of ledger or log that did decode the letter combinations for warranty purposes but without that ledger or log, decoding by anyone else would be impossible,...then or today. Hopefully, a pattern will reveal itself when enough serial letter combos are collected. BUT, even if a pattern doesn't become apparent, that will show that obfuscation of the Synchrophase production quantity was likely the goal and without the assigned sequences (that was probably in a log or ledger at the factory) decoding will truly be impossible. HERE'S WHAT WE WILL NEED - Before you E-mail your Grebe MU-1 or MU-2 serial letters. Confirm that the letter combination on the Instruction Card agrees with the letter combination on the back of the front panel (see photo right for location.) If the card letters don't agree with the panel, send us the serial letters on the back of the panel. Over the years, collectors have swapped chassis and cabinets to get the best condition combination but we are interested in the chassis construction versus the serial letters, so use the letters that are engraved on the back of the panel. NOTE: We will be dividing the Synchrophase production into three time periods, Early, Intermediate and Late depending on what components are in the particular receiver. Look at the tuning dials. Are they individually operated or are they chain-driven? If they are chain-driven, look at the two audio interstage transformers. Are they the same size or is one much larger than the other one? Look at how our log is sorted and you'll see what information we'll need to know to identify the vintage of the receiver versus its serial letter combination. Please mention any other indicators to help date your receiver and its serial letter assignment. This log will be updated often. photo above: The location of the serial letters on the back of the front panel is on the left side looking down past the left most tuning dial. Unless the front panel has been changed in the past, this letter combination is tied to the type of chassis construction. Chassis construction is how we will date the serial letter combination. Unless otherwise noted, serial letters are for MU-1 receivers. Also noted are any further component variations that would further "narrow down" the time period of manufacture. Please be sure to examine your MU-1 or MU-2 carefully because Grebe Factory/Dealer upgrades are difficult to tell from original. See section above on "Grebe Factory/Dealer Installed Upgrades and Modifications." Over 80 reported Serial Letters and I don't see any pattern. It looks like the codes changed often, probably every week, to further obfuscate production. It doesn't look too good for decoding,...Please, still send in your Synchrophase serial letter combos and maybe something will reveal itself when more combos are logged. - Henry Rogers, Oct., 2012. What do the Serial Letter Codes Indicate? I think the Synchrophase serial letter log is a good illustration of an experiment that produces the opposite of expected results (like Albert Michaelson's "ether wake.") I hoped to see a pattern in the MU-1 codes after a dozen or two combos were logged. Here we have collected well-over eighty combos that are tied to specific production indicators for date of manufacture and no discernable pattern has emerged. I doubt that anything can be determined about a particular MU-1 just from the letter code. That must have been the way Grebe wanted it. To speculate on a reason for the obfuscation: It might indicate that Grebe was trying to protect themselves from a Neutrodyne lawsuit settlement that would be based on total production quantities. It seems possible that the Grebe management came up with an undecipherable code that allowed them to identify each MU-1 and MU-2 receiver while preventing anyone else from discerning any useable information from just the serial letters. If you had the code book, like the Grebe factory must have, you could identify any MU-1 or MU-2 but, without the code book, nothing specific could be determined about anything involving production quantities. However, looking at the photograph shown to the right, which is the Grebe factory Test and Alignment Department, it's apparent that Grebe wasn't trying to hide the fact that the Synchrophase was a tremendous seller. Over one hundred Synchrophase chassis are shown in this photo. Each cart appears capable of holding at least twenty-five chassis and there are four carts in the area. Maybe advertising hype wasn't considered admissible evidence. Restoring the Escutcheons - These are 24K gold covered with a lacquer overcoat for protection for early models and gold lacquer for later models. Neither type should be cleaned with anything abrasive. The gold-lacquer over the brass base metal is very thin and delicate. Almost any cleaner that involves rubbing will remove the gold-lacquer. Since it is so thin, most of the escutcheons have some corrosion showing through and will typically look "spotted" or "dark." If your Synchrophase escutcheons are in good condition only use a soft paint brush to dust them. Never polish them with anything. Dusting lightly with a cloth is probably okay but don't rub. If your escutcheons are green with corrosion or severely spotted then something has to be done. I have found that the escutcheons do very well when cleaned with Sodium Hydroxide which is easily available in "Easy-Off Oven Cleaner." EOOC will attack the corrosion and not bother the gold-lacquer that is remaining (if any.) Spray on the EOOC and let it set for about 5 minutes and then rinse the escutcheon in cold water. If it needs more corrosion removal, then spray again, wait 5 minutes and rinse. Only rinse with water - DO NOT RUB with anything - this includes rubbing with your fingers. If you rub, you will end up polishing the metal slightly and will ruin that flat gold finish that the EOOC gives to the escutcheons. Let the escutcheons air dry. You will notice when they are dry that if there was any gold lacquer present, it will still be there but with the corrosion gone and the base metal chemically cleaned, the overall appearance of the escutcheons is that they are excellent condition originals. Reconditioning the Front Panel - The Synchrophase front panel is made out of bakelite. It is faux mahogany grain on the front and gloss black on the back. You'll find both mottled grain and linear grain faux in all periods of manufacture. The front of the panel was originally very glossy but over the years, cigarette smoke, finger grunge, various waxes and other contaminates usually have the panel looking flat, dark and with barely any character present. The Grebe Synchrophase lettering is filled with gold paint and usually that can barely be seen. First, remove the front panel entirely because you can't clean it correctly and thoroughly with the escutcheons mounted. Remove all of the escutcheons. The dial and vernier knob escutcheons have nuts behind the panel so take care not to loose them. Once the escutcheons are off you will be able to see several screws that were hidden. The nickel-plated screws hold the tuning condensers to the panel so remove them. The black wood screws hold the panel to the wooden base, remove them. Removing the round escutcheons will also dismount the controls from the panel. The panel should now have everything dismounted from it. Clean of the loose dirt with soap and water. Rinse well. Stubborn dirt and cigarette smoke residue can be removed with Glass Plus (DO NOT use Windex!) This will leave the panel clean and a little flat looking. Next use Wenol's Polish (English version of Semichrome Polish.) Polish one half of the panel at a time, the first time. Do a second polishing that does the entire panel. Polish with a good cotton cloth. You'll find the panel looks like new. The back gloss black seems to usually respond to just a good cleaning because it was never subjected to all of the dirt and grime that the front of the panel was. When remounting the escutcheons you will probably remember that they were mounted with screws and nuts. The center-of-panel nuts are hard to access on the back of the panel. I use masking tape wrapped with the "sticky side" out around the tip of a long screw driver. The nut can then be held by the tape and guided into position using the long screw driver. Once the screw threads engage the nut will turn itself off of the tape. Continue rotating the screw and the nut will tighten up. Don't over-tighten. The Cabinet - The Synchrophase cabinet is solid mahogany. The finish is medium to dark brown. The cabinet work is usually very good but since it's solid mahogany, cracks and splits are common. The cabinet is glued together with hide glue. If I have to repair splits or cracks, I use Franklin's Hide Glue. This isn't the real thing,...horse's hoofs and that sort of thing. Franklin's is synthetic hide glue and is the color of hide glue and sort of behaves like hide glue (except that it doesn't have to be hot) but it takes a very long time to set-up. Clamped joints usually take at least 12 hours before the clamps can be removed. The advantage is the color, which is amber, will blend into the wood and repairs are almost transparent. Franklin's Hide Glue bottles are dated because the shelf life is about 1 year. If the cabinet is a little dirty with minor scratching, try boiled linseed oil rubbed onto the cabinet with a small cotton cloth. Do small areas at a time and work the boiled linseed oil into the surface. You can rub by hand also but this leaves your hands smelling like BLO for a while afterward (even after several washings.) Wipe as much of the BLO off as possible and then buff. The BLO will clean and will also leave a bit of a finished surface. It leaves the cabinet clean and with an original looking shine. You can apply BLO once in a while but remember it does build up a finish and really more than two coats aren't necessary. If you are planning on refinishing a Synchrophase cabinet, you should have experience in duplicating older finishes. 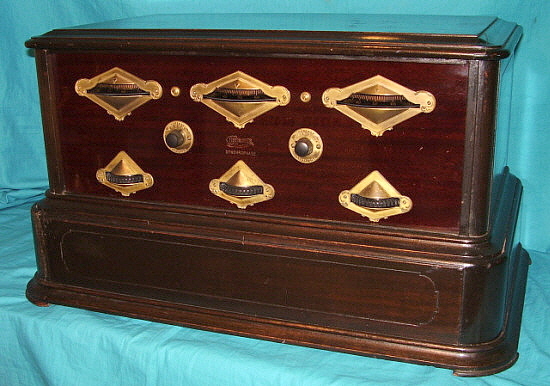 Most furniture restorers don't know how to do radio cabinets. Most of the time, even experienced restorers can only "come close" to duplicating the finish because we don't have the correct materials or the proper areas to work. 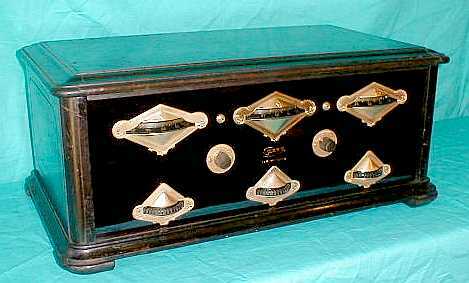 Most early radio finishes were shellac but right around the mid-1920s, nitrocellulose lacquer became popular. My guess is that Grebe was using lacquer. Luckily, nitrocellulose lacquer is still available in most areas of the country. Besides the actual finish, the wood preparation is extremely important. Where most amateur refinishers fail is by not using "grain filler" - I don't mean shellac or whatever else the major hardware stores sell as "grain sealer." Grain Filler is actual fiber mixed in an oily paste that is applied to raw wood to fill in the pores. The correct type of Grain Filler is available from Star Finishes in Ft. Bragg, California and is called "Star Grain Filler." The paste is colored and be sure to use either dark brown or black - not neutral. Once grain filler is applied correctly, you will only need a couple of coats of lacquer and no pores will show. Sand lightly between coats and apply at least three coats of lacquer. Try to look at as many original cabinets as you can so you get the color close. Remember, in high altitudes the cabinets take on a grayish-greenish color because of the UV light fades the finish. Two of my Synchrophases were exposed to a lot of light and have the gray-green cast to the original finish. The factory, 1924-7 color was dark brown. Interstage Transformers - The Grebe interstage transformers usually are 330 ohm DCR on the primary and 6.6K ohm DCR on the secondary. Though the ratio appears to be 20:1, the measurements are for DC Resistance (DCR) where as the actual ratio specified is the "turns ratio." Due to the greater lengths of wire needed to make each layer of turns, the secondary actually has much more wire (hence the greater DCR) to make the proper turns ratio. On early receivers, to accurately measure the primary DCR on the second AF interstage you must place the VOLUME control fully CW. Unless you can find good condition Grebe replacements, you will have to either rewind the bad core or you can buy a Stancor A-53 core to replace the bad original. The A-53 is nothing like the original Grebe transformer because the DCR is so much lower. The A-53 turns ratio is 3:1 but because of the low DCR the bass response is lacking. If you want to have performance similar to original, you can also use a vintage interstage transformer that you can salvage the core from. 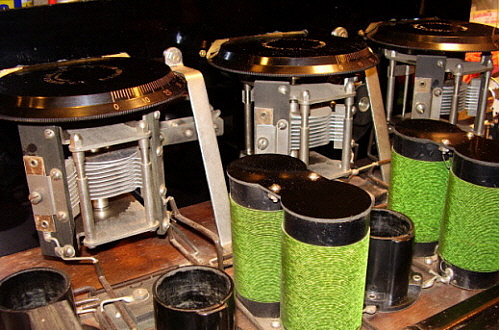 Thordarson made some of the best audio interstage transformers at the time and nearly all of them found today are still in good condition. The Thordarson's will sound much better than the A-53 replacement core. If you have a bad Low Frequency interstage using the A-53 will defeat the LF xmfr's whole purpose. Try to find a good Grebe original for a replacement. If one can't be found then salvage a larger size vintage audio interstage, like a Rauland, or similar type. The Grebe transformers are riveted together requiring the rivets be drilled out to get the transformer apart. Binocular Coils - The other common problem with the MU-1 has to do with the Binocular coil primary. This was wound with very fine solid conductor ~40 gauge wire. Any corrosion or physical stress like excessive expansion and contraction due to poor storage can cause this fine wire to break. When powering up your MU-1 using a good ABC eliminator, if you hear significant hum (you might also hear stations,) check the B+ at each of the RF amplifier tubes. Most likely, you'll find that one of the RF amplifier tubes doesn't have plate voltage due to an open primary on the associated binocular coil. You'll have to disassemble the coil which is difficult. The eyelets have pieces of TC soldered through both the primary and secondary forms to hold the primary form in position (along with a screw and nut on the other end of the coil forms.) These have to be removed before the primary can be extracted out of the secondary form. Once out, examine the primary carefully for breaks. You should find the break near one end of the coil. 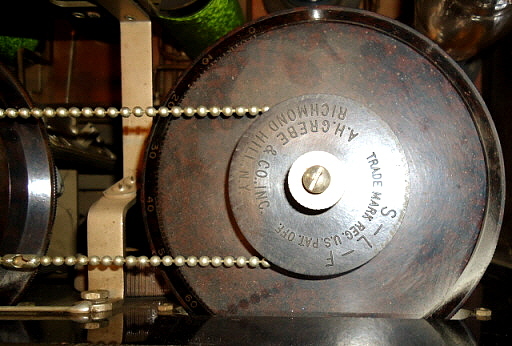 The original winding tension ends up breaking the coil at the ends due to expansion. Repair the coil and reassemble the binocular coil assembly and re-install the unit into the receiver. B+, C- Bypass Capacitors - It's also possible that the B+ or C- Bypass capacitors could be shorted. This is not common but it does happen sometimes. Check these capacitors carefully. They should have no DCR and their capacitance should read on any sort of C meter. Value shown on QST schematic is .5uf but all the ones I've measured read around 1.0uf. Rebuilding the capacitor requires taking apart the metal can and removing the original capacitor, replacing with a new modern capacitor (or parallel combos to fit into the can) and then resealing the metal can. Sometimes the cans can be unsoldered but it requires a very large soldering iron. Cutting is an option and when the new capacitor is installed the cut end can be re-installed with epoxy and the can repainted. VOLUME or TONE COLOR Shunt - Resistive Unit - This is a six-position, five section resistive shunt made up of a series of tapped wire-wound resistors. Ni-Chrome wire is used for the resistance with the wire being around 40 gauge. Moisture and expansion can damage the fine wire that is wound on a cylinder form. It's also possible that the connection to the arm of the switch can be broken with rough handling (the 40 gauge wire is exposed and easy to sustain damage.) Fortunately, the Ni-Chrome wire is not pure and it can be soldered to so repairs are not difficult. If a single resistance is open in the series another external resistor can be soldered to the back side of the contacts to complete the series value of the shunt. The resistance values are approximately 300 ohms (minimum setting and first tap) 50 ohms (second tap,) 150 ohms, 700 ohms, 1200 ohms and the last tap is not connected to allow disconnecting the shunt. The values do vary somewhat and are not critical as long as the minimum 300 ohm resistance is used and the progression from lower to higher values is maintained. Grid-Leak Resistors These resistors are almost always open. Measure any that you have and few are even close to what is on the label and most will measure infinity. 3 Meg is what Grebe specified. For a "quick fix" I use a NOS 2.5 to 3.0 Meg carbon resistor (NOS for the long leads) and place the resistor body inline with the glass tube and then carefully wrap each lead in a coil around the pointed end caps. >>> >>> The grid-leak resistor body supports the carbon resistor and it is held in place when inserted into the grid-leak resistor mount. If I really want a nice repro grid leak, I make one out of an old open grid-leak. First, I pull the end caps off. I have a lot of .25" glass tubing around so if the glass breaks, I just cut a new one. What I really need are the end caps. I drill a .062" hole in each end cap point. Then I fit a 3 Meg carbon resistor into the new glass tube and then fit the end caps onto the glass tubing. I also place a piece of colored paper around the carbon resistor so the rebuild is hidden. Finally, I solder the end caps to the protruding resistors leads which holds everything together. Clean with DeOxit - Before powering up the receiver, clean the three tuning condenser contacts to the rotor using DeOxit and lightly oil the main bearing for the rotor. This assures the condensers rotate easily and have noise free operation. Also, clean all of the tube socket contacts with De-Oxit and a stiff but small paint brush. Be sure to also clean the tips of the tube pins where they will fit against the tube socket metal contacts. This will assure a noise-free and proper operation of the tubes. On later models with the bandswitch, clean the slide contacts with a DeOxit saturated Q-tip. UX-201A Tubes - "Burn-in" - When first powering up any battery-operated receiver you will notice that the sensitivity and volume are lower than expected. This is because the UX-201A tubes have probably been laying around and haven't had the filaments powered-up in decades. The UX-201A tubes have thoriated-tungsten filaments. The filaments are actually a pure tungsten wire that has an oxide coating (like a paste that hardens) that contains thorium. The thorium is in the coating to do a couple of things. First, thorium is a very natural emitter of electrons. Also, since the thorium readily emits electrons, the filament only has to be heated to an "orange" color for good emission. The older 201 tubes with pure tungsten filaments had to be "white hot" to emit electrons. This means that where the pure tungsten 201 tubes required 5vdc at 1A for good emission, the new 201-A, with thoriated-tungsten filaments only required 0.25A of filament current (at 5vdc) for the same (or actually better) emission. Unfortunately, with decades of inactivity, the thorium atoms that are part of the coating will migrate or sink down into the coating. The thorium has to be at the surface of the coating to emit electrons. Luckily, it's very easy to bring the thorium back to the surface. UX-201A tubes have to "burn in" but this process is almost natural and happens as you use your battery-operated radio. It takes a little bit of time for the thorium to migrate back to the surface and then the tube (or tubes) will operate with full gain. Usually about a half and hour at normal filament voltage will have the tube working properly. After the initial "burn-in" time, each time the tube is now powered-up, it will operate at full gain almost immediately. Neutralization - If the MU-1 oscillates while tuning through strong stations the "balancing" capacitors need to be adjusted. "Balancing" was a term created by Grebe to describe the neutralization of the two RF amplifier stages. Obviously, "Balancing" helped to hide the fact that the Synchrophase was a Neutrodyne and subject to a patent infringement suit. Though it was called "balancing," it is really "neutralizing" and there is a section below on how to do it. Only do the neutralization adjustments after the tubes have "burned-in." 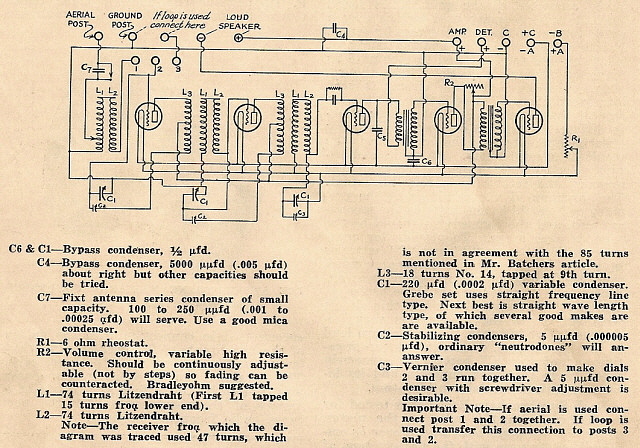 Schematics - Rider's Perpetual Troubleshooter's Manual Volume I has all three MU-1 schematics and also has the MU-2 schematic. These schematics are not in the Abridged VOL I-V manual. There was also a schematic published with the April, 1925 article in QST magazine by Ralph Batcher, who designed the S-L-F condensers. This is for the early version of the MU-1. It is shown below because it is easier to read since it is drawn more like modern schematics. Note there are a few errors, e.g., C1 should be C4, two C1s are listed, etc. Also, the values differ from measured original components. Powering Up the MU-1 - You'll need a lot of accessories to power up any battery operated receiver. Here's what you must have available for the MU-1. 1. A Power Supply that will provide minimum 6.0vdc at a minimum of 2.0 amps. The current draw on the filaments is 1.25 amps and then if you have the dial lamp add another .15 amps. I like to have a little bit of reserve current available as you then aren't drawing maximum for the supply which usually ends up causing higher ripple on the A supply. Also note that a fully charged lead-acid A battery would have been at +6.8vdc. The Filament rheostat was designed to work with +6.8vdc down to about +5.8vdc when the A battery then needed to be recharged. With +6.0vdc, the Filament Control will be set somewhat higher than what is marked on the early Instruction Cards. 2. B Power Supply for +45vdc and +90vdc, very light current draw probably less than 50mA average. If you have the later MU-1 you'll also need +135vdc if you want to run the UX-112 audio output tube. You can also just run a UX-201-A tube and reduce the +135vdc to +90vdc and reduce the -9vdc bias to -4.5vdc. 3. C Power Supply or Batteries for bias voltage -4.5vdc on early MU-1 and -4.5vdc and -9vdc for later MU-1. I just use series AA batteries because bias current draw is practically nothing. NOTE: Using Batteries for Power - You can use batteries entirely for powering up the MU-1 - that's how it was originally intended to be operated. It's expensive but the batteries for +45vdc are still available as "instrument" batteries. Also, Gates makes several types of "gel-cell" type lead-acid batteries in various amp-hour capacities. What you will find in operating the receiver on batteries is an extremely quite background noise with absolutely no perceptible hum. It's without doubt the best way to operate the MU-1 or any battery operated radio. However, expense and a finite battery life usually mandates using A-B-C eliminators instead. 4. Tubes - Five good condition UX-201A tubes for early receivers and four UX-201A and one UX-112 tube for later receivers. 5. Loud Speaker has to be either a horn speaker or cone speaker. These are high impedance magnetic speakers that have the solenoid coils directly in-line between the B+ and the audio output tube plate. You could use a modern speaker if you use the proper audio output transformer of about 5K to 10K Z ohms on the primary and 4 or 8 Z ohms on the secondary. Most enthusiasts use the correct vintage speakers to experience what the original users heard for sound quality. 6. Antenna must be at least 50 feet long but 125 feet long is what the MU-1 was designed for and works best with. Longer antennas don't necessarily work better. You can disconnect the selectivity link if the antenna is longer than 125 feet otherwise the first stage won't tune. Try to have the antenna as high as possible. Also, these early battery radios were generally designed to work into an "end-fed wire antenna, sometimes called an "inverted L." These antennas are generally physically short for the frequency (AM BC band) and present a high impedance to the antenna stage of the receiver. This is what the antenna stage was designed to work with for an antenna. Other types may not work as well, especially low impedance antennas like dipoles or vertical antennas. 7. Earth Ground was required when the receiver was operated on batteries. When using AC operated power supplies you can sometimes achieve ground via coupling through the power transformers and the house ground. This can work okay but generally a real Earth connection is better. Ground rods are almost a necessity since very few houses still have all metal cold water pipes to connect to for Earth ground. If you aren't already set-up for running battery operated radios, it can be expensive and a real hassle to acquire everything that is necessary. Unfortunately, everything mentioned is required to operate the MU-1 or any other battery operated radio. There is an inexpensive A, B and C power supply kit that is available from Antique Electronics Supply in Tempe, AZ. It is priced at about $55 plus shipping. It is built onto a wooden board but does work really well for the price. I use a Lambda 5vdc 4A supply that is adjusted to +6.0vdc and then I use a vintage RCA Duo-Rectron B Eliminator that uses an 874 regulator tube so the output voltages are constant regardless of load. I use two sets of three AA batteries for C bias requirements or an adjustable Lambda supply if other, higher bias voltages are required. A dual adjustable voltage bench power supply (RCA) can also be used if I really need a lot of different voltages. Adjusting the "Balancing" Capacitors for Proper Neutralization - If, when you are tuning through stations, you hear an oscillation then the Balancing (neutralizing) capacitors need to be adjusted. The Neutrodyne circuit uses capacitive feedback between the plate and the grid of an RF amplifier stage to cancel out the vacuum tube interelectrode capacitances that allows oscillation to occur. With insufficient capacitive feedback the stage will oscillate because of the high gain of the circuit. With just a little more capacitive feedback the stage will be regenerative and have good gain and selectivity but might be somewhat unstable under certain conditions. With too much capacitive feedback the stage will not oscillate but also might not have enough gain to amplify the signal. In the Synchrophase (and all other Neutrodynes) the object is to have high gain with sharp selectivity and no oscillation while tuning through a strong signal. This is achieved with just a little regeneration but not too much since that would cause the stage to oscillate. To set the neutralizing capacitors, first the RF amplifier to be adjusted must only present its interelectrode capacitance in that stage. This is achieved by disabling the tube filament for the stage to be adjusted. A couple of small pieces of electrical tape on the tip of one filament pin is all that is necessary to disable the tube filament. IMPORTANT NOTE: Only tape one pin, leave the other pin able to make contact inside the tube socket. If you are neutralizing a later Synchrophase with the cushion sockets you will have to use a "dud" tube with an open filament and with no internal shorts between the grid, plate or filament. Be sure to check the "dud" tube for any obvious structural damage that would affect the tube's internal capacitance. The only problem with the tube should be an open filament. Also, make sure all of the supply voltages are close to the specified value and the receiver is operating correctly except for the neutralization adjustment. You'll have to have the receiver out of the cabinet to access the neutralizing capacitors which are located on the tuning condensers for the first and second RF stages (the left most and center tuning condensers.) It's best to use a fiber non-conductive screw driver for the adjustments on early versions or a 1/4" open end wrench for the later versions (the bandswitch location prevents access by a screw driver on later versions.) Back the neutralizing trimmer capacitors out slightly which will reduce the capacitive feedback. Tune in a strong station near the middle of the tuning range. You will notice that the receiver will probably oscillate as you tune through the station but tune it in "on the nose." Next, install the tube with the disabled filament into the 2nd RF Amplifier socket. You will hear the station and some oscillation even though the stage is disabled. Increase the neutralizing capacitance trimmer on the center tuning condenser until you have greatly reduced the level of the signal and the oscillation. Now move the disabled tube to the 1st RF Amplifier position and move the good tube from that position to the 2nd RF amplifier position. You will hear the station again. Increase the neutralizing capacitance with the trimmer on the 1st RF stage condenser (left most dial) until the station signal just disappears. Now switch the RF tubes back so the disabled tube is again the 2nd RF amp. If you hear the station then increase the 2nd RF neutralization capacitance until the station just disappears. If you don't hear the station then back out the neutralization capacitor until you do hear the station and then increase the capacitance until the station just disappears. Remove the disabled tube and remove the tape from the filament pin and re-insert the tube into the socket. The station should be coming in very strong and as you tune through the signal (with any of the stages) no oscillation will occur. The RF amplifiers are now neutralized and adjusted for maximum stable gain. Grebe was always vague about adjusting the Balancing Capacitors and never published a procedure. They insisted that the factory settings were good for all variations in tube interelectrode capacitance. This was probably true, 80+ years ago. Nowadays, we have no idea who has "tinkered around" with the neutralization adjustments not really knowing how or what they do. It's an easy procedure to reset the neutralization so don't let the fact that the Grebe manual says it's not necessary stop you - adjust it properly and the Synchrophase will really be a sensitive and selective receiver afterward. photo above: The neutralizing capacitors are located on the side of the tuning condensers. The capacitor on the tuning condenser to the left is a trimmer adjustment for identical dial indications on the 2RF and Detector stages. The center and right hand trimmers are for neutralization. This photo shows the early style chassis as viewed from the rear with tubes removed for photo. In the later versions of the chassis, the bandswitch blocks screw driver access to the neutralizing capacitors and a 1/4" open-end wrench must be used for adjustment. SET-UP - The Grebe MU-1 is regarded by vintage radio collectors as the "best performing battery-era TRF radio." This has been the standard belief among radio collectors about the MU-1 for decades. Let's state here at the beginning that since the MU-1 was evolving rapidly there is quite a difference between the early receiver and the later versions. Most important is the frequency coverage. The early receivers only tune up to a little above 1300kc. But with that limitation stated I should also mention the advantages. Most radio collectors that operate their MU-1 receivers don't use the chain coupled dial system. With the early sets, there is no chain coupling to bother with. Next, most collector-operators don't use the +135vdc and UX-112 audio output. Most just install a 201-A and run it on +90vdc with -4.5vdc grid bias. With the early sets, this is how they are operated anyway. I powered up CTPB using a 6vdc 4Amp Lambda power supply for the A voltage, a vintage RCA Duo-Rectron B Eliminator was used to provide +45vdc and +90vdc B voltages. These are regulated voltages (using a 874 regulator tube in the Rectron.) I used three AA 1.5vdc batteries in series for the C bias voltage. I operated CTPB in the ham shack so I could use one half of the 135' inverted vee as the antenna. This was one side of the 43' feed line and one half of the antenna at 65' for a total length antenna (end fed wire) of 108'. This would have been considered a typical length antenna in the 1920s. Height was 30' at the highest point. The ground used was the ham station ground which is ground rods and radials - not your typical 1920s ground but it might be comparable to the old "cold water pipe" ground that had lots and lots of metal as a counterpoise and earth ground. The speaker used was a Rola Recreator horn speaker which is generally considered one of the loudest playing horns - not necessarily the "best sounding" but very loud, almost shrill sounding. Good for weak signals! 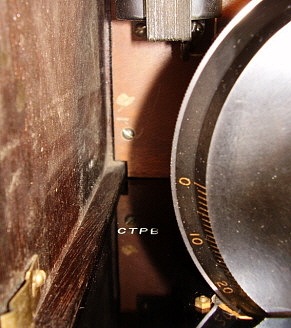 CTPB is a functional, all original example of the early MU-1. However, that doesn't mean I could operate it "as-is." As with almost all battery-operated radios, CTPB needed to have the UX-201A tubes "burned-in." The procedure is covered in the section above, "Radio Circuit Problems." I also cleaned the tube pins, the tube socket contacts and cleaned with De-Oxit the tuning condenser contacts. Additionally, I adjusted the neutralization per the procedure in the section above, "Adjusting the "Balancing" Capacitors fro Proper Neutralization." This assured that CTPB was operating at it peak level of performance. TEST - During the daytime, only local stations can be tuned in but these consist of powerhouse 50KW stations in Reno or a 10KW station in Carson City that are very strong as easy to tune in. Weaker daytime stations might be the two AM stations in Fallon about 60 miles away. These are still easy to find and tune in properly. Nighttime operation is full of strong signals and the need for the Neutrodyne TRF circuit is realized when trying to separate these signals. CTPB does a fine job and there are two good tests in our area. First is to separate KKOH 780kc from KKOB 770kc. This is an extremely difficult test as KKOH runs 50KW and KKOB is in Albuquerque, NM. While I can receive KKOB fine, I can't entirely eliminate KKOH. The second test is to separate KPLY 630kc in Reno from KFI 640kc in Los Angeles, CA. This is an easier test (because KPLY isn't running 50KW) and the MU-1 separates these two stations with ease. What is noticed in tuning the MU-1 is just how selective the two RF stages are with stations peaking at plus or minus one division. On the other hand the Detector tuning seems broad compared to the sharp selectivity of the RF stages but this is typical of most battery-era Neutrodynes. What is obvious when comparing the MU-1 to other TRF battery radios is the effect of the S-L-F tuning condensers. >>> >>> Usually, mid-twenties radios will crowd all of the BC stations above 1000kc into the top one-quarter of the tuning range. Not the MU-1. BC stations are evenly spread out over the entire dial and even though the top frequency tuned is around 1300kc, the stations in that region of the band are not relegated to just a few dial divisions. Sensitivity is the best of all of the battery operated TRF-Neutrodyne receivers. In just a few minutes of operation, I had tuned in KFMB in San Diego, KOA in Denver, KSL in SLC and many other power house stations at about 500 to 1000 miles distance. Many weaker stations could also be tuned in but station identification is not mentioned very often in broadcasting these days. I would estimate that 1500 miles distance would be easy for the MU-1 on almost any night when setup as CTPB was for this test. Sound quality is of course dependent on the speaker. I was using a Rola Recreator horn speaker that, while very loud, is not a particularly mellow sounding horn. The MU-1 CTPB was able to drive the Rola quite loud at only about 2 or 3 on the VOLUME control with the FILAMENT control set at the recommended "4" which is about +4.7vdc on the tube filaments with a +6.0vdc A supply. If you're looking for an accurate sound representation of what the MU-1 sounded like when tuned to a high power, high quality broadcast station in the twenties, you'll have to use a good quality horn speaker. Stay away from any of the horns that use the ferrous-diaphragm magnetic-coupling, like Atwater-Kents, RCA UZ-1325, etc., and use a direct-driven diaphragm horn speakers such as the Rola Recreator, a Baker-Smith "Sylfan", the Western Electric 10-D, a Westinghouse FH, a Magnavox M-4 (direct-driven mica diaphragm) or the Maganvox R3-B (Lo-Z voice coil with output transformer.) These horns play at least twice as loud as magnetic-coupled diaphragm horns and allow easy reception of DX stations. SET-UP - The later MU-1 has the advantage of the extended frequency coverage to allows tuning up as high as 2000kc, or the top of the 160 meter ham band. This, of course, allows the operator access to all of the AM BC stations above 1300kc. The MU-1 we are testing is MU-1 RJNA which started out as a typical mid-1925 upgrade receiver. Probably sometime in 1927 or so, the owner wanted his MU-1 to have some of the later upgrades. This MU-1 has Grebe Factory installed UX-112 audio output, Grebe low frequency 1st AF transformer, wired for +135vdc B+ and -9vdc C-. Additionally, the Factory replaced the bayonet socket on the Detector tube with a Grebe cushion socket. All of the other sockets are still bayonet-type. So, this is a close as I can come to the latest of the MU-1 production. RJNA has everything except the capacitor TONE COLOR control and all cushion sockets. MU-1 RJNA was powered up and run with all of the same accessories as MU-1 CTPB with the exception that +135vdc, along with -9vdc grid bias, is required for the UX-112 audio output tube. The RCA Duo-Rectron provides +135vdc regulated so hook-up only required an extra connection to that terminal and also an additional three-pack of AA batteries to add to the existing three-pack to create a -9vdc and -4.5vdc C- bias voltages. I wanted to see if I could notice any significant audio improvement with RJNA since it had all of the upgrades necessary to operate like a late version MU-1. With that in mind, I replaced the Rola horn speaker with a Peerless Reproducer cone speaker. The Peerless is without doubt one of the best sounding Hi-Z magnetic cone speakers available. Its "cathedral" style wooden cabinet has made it a very popular collector's speaker but its high-quality reproduction is what we are interested in for this test. I have had MU-1 RJNA for about 15 years. It was brought to the museum to be sold to us along with its truly original Grebe Synchrophase Manual (yes, you can tell the difference between the originals and the excellent reproduction that Radio Age produced in the early 1980s.) After the purchase, I did a cosmetic restoration and checked everything for operation and put the receiver in a display case. I never put RJNA into operation at that time. So, I had to actually do a few things before the test to assure that RJNA was operating correctly. I cleaned the rotor contacts on all condensers, lubed the rotor bearings, cleaned the tube socket contacts and tube pins, cleaned the bandswitch contacts and tested the two bypass condensers. I performed a complete power-up test and found that the receiver didn't operate very well at all. I found that the 2nd RF amplifier tube socket had a severely bent pin contact that didn't allow the tube filament to operate. I had a replacement original socket so the defective one was replaced. Still, the receiver didn't tune correctly with the tracking between the stages off by 10 to 20 divisions on the dials. They should agree within a few divisions. Measuring the RF amplifier plate voltages revealed that the 1st RF amplifier tube didn't have plate voltage and this was due to an open primary on the associated binocular coil set. I had to remove the coil set and disassemble it to repair the primary winding. Then reassemble and re-install. Finally the MU-1 began working as expected with loud signals and tracking that was within a few divisions on all dials. I then set the neutralizing capacitors per the procedure elsewhere in this article. Now, MU-1 RJNA was ready for a testing session. TEST - The first thing noticed is that the Chain-drive is somewhat of a nuisance. The narrow Neutrodyne selectivity requires that the two RF stages be in accurate tune and the Chain-drive gets you close on local stations but you'll always have to slightly "tweak" the adjustments of the two RF stages for DX stations. You'll find yourself always lifting the lid to loosen or tighten the knurled nuts to engage or disengage the chain-drive depending on what you are trying to receive. Also, the Chain-drive requires using the large center dial for tuning as the vernier drive will not turn all three dials coupled together. You can use two hands and turn the center and right hand verniers and this will tune all three dials simultaneously. It's easier to just loosen the knurled nuts on top of the sprockets and tune all of the stages individually. At the time the Synchrophase was upgraded, single-dial tuning was considered very desirable (or maybe just an advertising gimmick.) Today, on the MU-1, it's virtually useless. NOTE: It has been reported by a few MU-1 enthusiasts that their chain-drives work great and can be driven by just the center vernier. This requires exceptional mechanical condition of all parts plus thorough cleaning and lubrication of the condenser bearings. The bottom chassis board can't be warped as this will affect the mechanical alignment. Let's just say that most MU-1s will have some trouble driving all three dials coupled together but there will be exceptions. >>> >>> The bandswitch increases the tuning range of the MU-1 from a high of about 1300kc up to around 1900kc. You can actually tune in 160M hams. It also allows tuning in the region of 1600kc to 1700kc where more recent broadcasters have been placed. The effect of the S-L-F tuning condensers is even more apparent in the higher frequencies. The actuation of the bandswitch is somewhat cumbersome being located at either end of the central tuning dial but the slide switch does function fine. So, for the mid-1925 improvements, the Chain-drive was not really very usable unless you only listen to local stations. The increased tuning range with the band switch addition really improved the MU-1 and gave it one of the widest tuning ranges of the mid-1920s battery sets. The mid-1926 upgrades greatly improved the audio reproduction. Since we are using a Peerless Reproducer cone speaker, which will sound very different than a Rola Recreator, the comparison will be how pleasing the sound is from the Peerless and how loud does it play using the +135vdc B+, the UX-112 audio output tube and what is the effectiveness of the TONE COLOR control. Wow! That's the impression when powering up a 1926 MU-1 after running a 1924 version. The audio power is very apparent and so is the increased bass response. It's easy to drive the Peerless to extremely loud and because it's a cone speaker, it doesn't rattle too much (like some cheap speakers do.) The modern AM Broadcast stations do tend to overdrive the Peerless so high volume will result is some bass distortion. Bass response improvement is dramatic after listening to the 1924 version. Don't expect modern, "booming" bass response but the improvement over the earlier MU-1 and Rola horn is very apparent. The TONE COLOR control does noticeably change the audio frequency response with position 1 sounding almost muffled and position 6 (open) almost flat. Usually, the MU-1 sounds best (with the Peerless) with the TONE COLOR at about 3. When receiving a weak station it's better to have the TONE COLOR at about 6 for better intelligibility. Certainly, we are using one of the best sounding cone speakers, the Peerless Reproducer, known for its mellow reproduction. Other cones also have their advantages and their disadvantages. The cone speakers with actual enclosures seem to be better sounding, although the Radiola 103 is a nice sounding cone with no enclosure. The Radiola 100A metal mantle-clock shaped cone speaker is also a nice sounding unit. Unfortunately, many of the beautiful, art-styled cone speakers are anemic reproducers and sound awful. The later MU-1 is so sensitive that the Long Antenna link had to be opened for local stations when using the 103 ft antenna. I performed the same selectivity test on RJNA and found that since the Long Antenna link was open, it was easy to separate KKOH 780kc Reno from KKOB 770kc Albuquerque. So, the final verdict on the later version MU-1 is that the Chain-drive is almost useless but the frequency coverage extension with the bandswitch was a nice improvement. 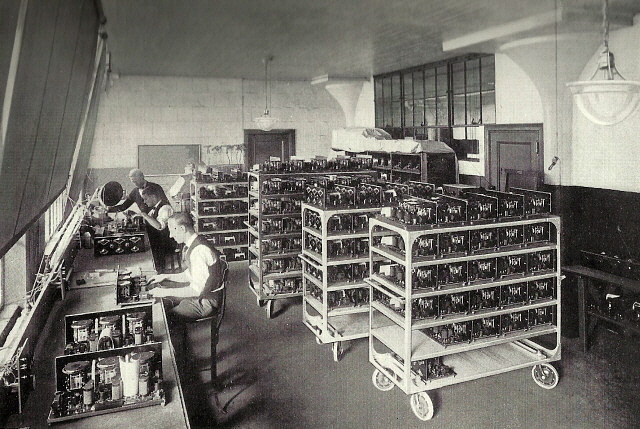 The 1926 audio upgrades were THE major improvement for the MU-1 providing great audio reproduction. I know most collector's don't bother running their MU-1s with the UX-112 and +135vdc plate voltage but, if you have a high quality cone speaker, give it a try. I was very impressed. In the two reviews above, I tested the early version of the MU-1 and compared it to the test of the 1926 upgraded version but this leaves out the 1925 upgraded version. I have MU-1 SRSS that is a 1925 version of the MU-1. Although I haven't run SRSS specifically for this article, I have owned it since 1975 and have operated it many times in the past. If you are looking for the extended frequency coverage without all of the upgraded audio improvements, then the 1925 version is for you. You can run all UX-201A tubes with +90vdc maximum B+ and you will only need one -C bias voltage. Also, a horn speaker is appropriate for the 1925 version and this version will sound great using a Rola or other high quality horn. Additionally, you have the extra conveniences of the dial lamp and the fuse lamp along with the dial chain-drive. So, the 1925 version of the MU-1 has many advantages for the collector/operator that wants a very sensitive and very selective receiver without all the hassle of the audio upgrades that require more voltages and a different tube for the audio output stage. Hopefully, these tests will help you decide if you'd rather have the early version MU-1, a mid-production model or a later version of the receiver - but, you'll probably be like me and want to own and operate all of the different versions! Conclusion - In 1927, the MU-1 was rapidly becoming obsolete. Many "high quality" Neutrodynes were on the market that performed as well as, if not better than, the Grebe MU-1 (the incredible FADA 8, for one.) Grebe did introduce a single dial version but it wasn't produced in any quantity. By late 1927, AC power operation was the latest offering from the manufacturers. Grebe responded with the Synchrophase AC-Six, a thoroughly different looking radio receiver than the old MU-1. For those in areas without AC power, Grebe offered the similar-looking Synchrophase Seven battery operated receiver. Later, for a nominal sum of $55, the factory would convert a Seven to AC operation. In the end, Screen-Grid tubes sets and eventually a few superheterodynes were produced before Grebe went bankrupt, a victim of the Great Depression. Grebe had every intention of reforming the company but he died, at age 40, from complications following surgery. 1. Grebe Synchrophase Manual - covers 1926 version. High-quality copies were published by RADIO AGE (Don Patterson) in 1983. Many of these reproduction manuals can still be found on eBay. The only difference between the originals and the copies is the original uses a small representation of the MU-1 diamond escutcheon to end each section and these are colored gold in the original manuals while they are black in the copies. Also, Don had to add the reprint info on the inside back page. 2. Grebe Radio 1925 Advertising Brochure - Covers early versions of the MU-1 and MU-2. Multi-color and high-quality photos and artwork. This brochure states that the escutcheons are "dull 24K gold covered." Information on WAHG and many earlier Grebe CR-series models. 3. Rider's Perpetual Troubleshooters Manual VOLUME 1 - schematics from 1924, 1925 and 1926 for the MU-1 and schematic for the MU-2 from 1926. 4. Radio Age, Don Patterson - multi-part article on A. H Grebe from the 1980s. 5. Radio Manufacturers of the 1920s, Vol. 2, Alan Douglas - history on A. H. Grebe & Co., Inc.